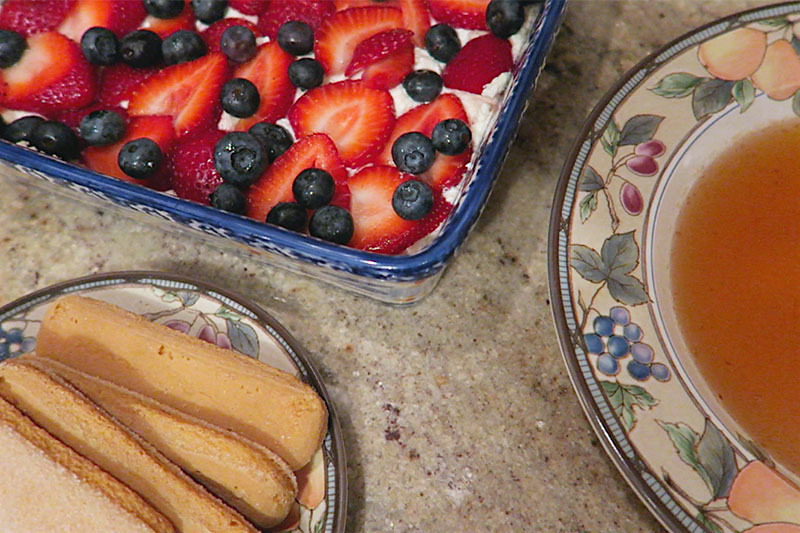 I made a tiramisu for 4th of July and made it look very patriotic with a red, white and blue color scheme. This tiramisu is slightly different from the traditional kind because there’s coffee or coffee liqueur. Instead a honey simple syrup is made to dip the ladyfingers in. 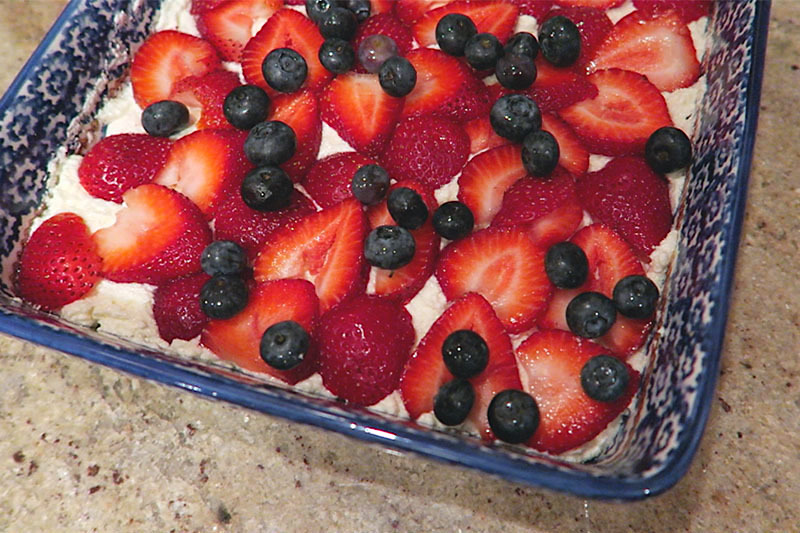 Also the addition of fruit, in this case strawberries and blueberries, allows this no bake dessert to be much lighter. I’d say that this is the summer version of the well known tiramisu. Below you’ll find a video of me making the tiramisu. I decided to film the process on a whim since I do want to have baking and dessert videos on my YouTube channel. I hope to share more videos like this in the future. 1. Place water, sugar, and honey in a small saucepan and simmer over medium heat until sugar dissolves. Remove from heat and set aside. Allow honey simple syrup to cool completely, about 1 hour. 2. In a large mixing bowl, beat together mascarpone and sugar until light and fluffy. 3. In another bowl beat together heavy cream and vanilla until medium peaks form. 4. Fold whipped cream into the mascarpone mixture until fully incorporated. Set aside. 5. Pour honey simple syrup into a shallow dish and dip ladyfingers, turning once to coat for a few seconds so that they can absorb some of the liquid. 6. Line the ladyfingers in a single layer, in the bottom of an 8”x 8” baking dish. 7. Top ladyfingers with half of the mascarpone mixture and smooth the surface with a silicone spatula. 8. Place a layer of berries over the mascarpone mixture, reserving the remaining berries for the top. 9. Repeat step #4, but over the first layer and top with the remaining mascarpone mixture and smooth the top over. 10. With the remaining berries, decorate the top of the tiramisu. 11. Refrigerate for 4 to 6 hours and up to 1 day. Then enjoy! "Disneyland & California Adventure Vlog 2015"
"The Wizarding World of Harry Potter Photo Diary + Vlog"